Effective mobile working is key for the NHS. It is widely recognised that a clinician able to access patient records and other online resources at the point of care is an enabler of faster, better quality, more efficient healthcare. Many NHS managers and staff also need access to work in a flexible manner. Yet ‘effective’ mobile working can be a huge challenge – connectivity issues, lack of user confidence and slow and clunky technologies all present difficulties that can thwart expected benefits. The goal is to find technology that enables, as opposed to impedes, workflows. County Durham and Darlington NHS Foundation Trust is one of the largest integrated care providers in England, serving a population of around 650,000 people. With an 8,000-strong workforce, they provide acute hospital services at Darlington Memorial Hospital and University Hospital of North Durham, with planned care made available from Bishop Auckland Hospital. The Trust also provides community services from 6 community hospitals and 80 other community based locations. To find a more user-friendly, cost-effective mobile working solution to improve staff workflows. Two-factor authentication VPN using the NHS smartcard and connectivity management intelligence simplifies workflows and increases productivity. Mobile working was already rolled out at County Durham and Darlington NHS Foundation Trust. Community clinicians were using a basic two-factor authentication VPN solution, but the technology was not particularly user-friendly; a combination of connectivity issues and the relevant lack of competence and confidence of the clinicians in using the remote technologies and devices was also proving problematic. To gain remote access to clinical applications, clinicians battled with multiple log-ins, a 3G dongle, and a VPN system of which they had little understanding of how it was designed to work. Once logged in it was difficult for staff to understand the complexities of VPN access, including the connection signal status or how to manage it. The goal of ‘real-time access’ was never fully realised due to it being a complex workflow that took a clinician at least 15 minutes to know if they had a good enough signal and quality of connection to gain access to electronic clinical records. The Trust recognised that to realise the benefits of true mobile working, they needed a two-step authentication solution that was easier to use and understand and that also offered scalability so that corporate staff, as well as clinical staff, could take advantage of the remote access technologies. We wanted a solution that was easy to use and offered two-factor authentication. ITHealth’s ability to integrate their VPN solution with the NHS smartcard was very appealing. Following market research, County Durham and Darlington soon became aware of how ITHealth helps other NHS organisations with their remote access challenges. The Trust was particularly interested in ITHealth’s ability to integrate their two-factor authentication VPN solution with the NHS smartcard – without requiring any modifications to the smartcard. Staff at the Trust were already familiar with using the smartcard to log-on to clinical systems, so a process that followed a similar approach to gain remote access was very appealing. Futhermore, ITHealth offered Monitor – a user-friendly connectivity automation tool that works alongside Secure-IT, or indeed any other two-factor authentication solution. By reducing the number of steps required to establish a VPN connection and showing the performance and quality of that connection, Monitor helps users make informed decisions about whether they should attempt to work remotely, information which in turn helps them to optimise their working time. Prior to using Secure-IT and Monitor, clincians had to work through 5 log-ins. With the new solutions, log-ins reduced to 3 – improving user-friendliness and streamlining workflows, thus saving vital time. During the more automated log-in process, the Monitor software is set to detect network connectivity, i.e. wired or WiFi; if these are not present Monitor will launch 3G or 4G. It also checks response times from the end point to ensure a ‘good’ connection. The user is advised of signal strength and response times via a traffic light indicator: green for ‘go’, amber for ‘marginal’, and red for ‘there is an unacceptable level of signal and quality of connection present, so do not try to proceed’. 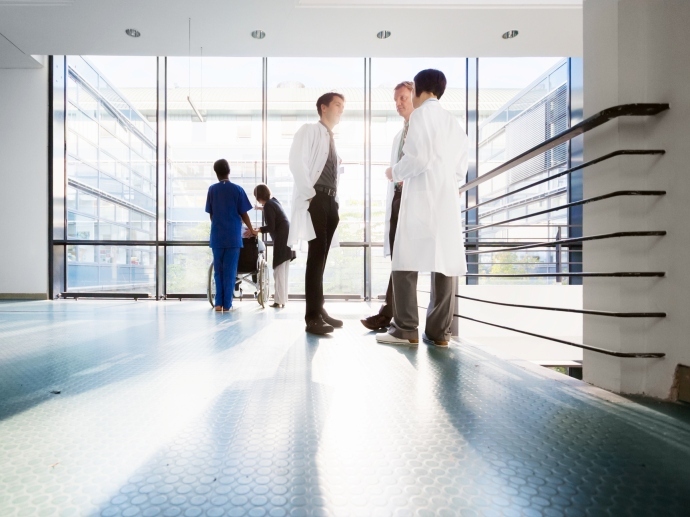 Knowing whether a network connection is viable saves time for the mobile clinicians, thereby adding to their productivity and user experience. As the details of all user connections are saved by the Monitor software, management reports can also be produced to identify which mobile internet service providers are enabling good service, how often staff are receiving a good signal, and also if they have been able to access the required applications. County Durham and Darlington purchased 1,500 licences with the intention that these would be rolled out to the community clinicians. However, since both the Secure-IT and Monitor software was being so well received amongst the clinical team, the technology was also made available to the corporate team. The traffic light system is great – really intuitive and easy for users to understand. By working in partnership, County Durham and Darlington and ITHealth have introduced transformational ways of working for both the Trust’s clinical and corporate teams – significantly improving upon previous difficulties with coverage, log-on time, and assessment of signal strength. Increased productivity: less onerous log-in procedures to gain remote access has freed up vital time for clinicians and corporate staff. More contact-time with patients: Less time battling to gain access means more time is dedicated to delivering patient care. Reduced costs: accrued from greater staff productivity, improved time efficiencies and the solution costing considerably less than many comparative solutions. Improved user confidence: easy-to-use, intuitive technologies has vastly improved user experience. Greater job satisfaction: clinicians and corporate staff benefit from the flexibility to work ‘effectively’ on the move. Easy to support and manage: integration of the smartcard simplifies management and detailed usage reports allow greater control over mobile users. Both the two-factor VPN and connectivity management solution can be delivered at scale. Since the Trust are almost reaching capacity of their current license purchase and it is being so well endorsed by users, the Trust have plans to increase capacity and further roll-out the mobile working solution throughout the organisation. At County Durham and Darlington, mobile technology is now seen as being much more of an ‘enabler’ to effective remote working, as opposed to an impediment. The ITHealth solution is innovative, easy to implement and use, requires minimal administrative overheads, and has good reporting tools – all round a fantastic solution.